UniPhi is a toolbox for Simulink that facilitates the rapid development of embedded applications, enabling a modular model architecture in which target-specific and target-independent functionality are decoupled. 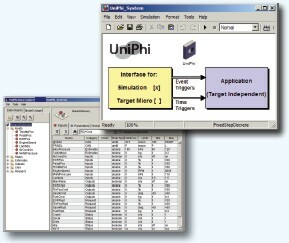 UniPhi is a toolbox for Simulink that facilitates the rapid development of embedded applications, enabling a modular model architecture in which target-specific and target-independent functionality are decoupled. System variables and calibration parameters are easily managed via a data manager, facilitating effortless model management and powerful plug-and-play development of any embedded system. Through the Signal Manager interface: create, view, find, or change the data signals available in your model. Feature dependencies can be easily managed utilizing UniPhi blocks and architecture - avoid hand-routing signals and spaghetti models. Instantly switch between different targets - e.g., between MPC56x, MABX and Simulation! Follow best software development practices - supports a modular software architecture. UniPhi has enabled customers to develop complex engine management and body control strategies. Concept algorithms are easily integrated into large, complex strategies assembled from reusable feature libraries. Efficient production quality code can be automaticaly generated. UniPhi, used in conjunction with the Mathworks Embedded Coder and Micro & OS Blocksets from SimuQuest, enables the code for complete applications to be generated without the need for any hand code. Powerful script interface allows you to use UniPhi to get data from Excel, Access, Word, or any data source accessible from MATLAB! User attributes can be added so that all of your data dictionary information can be represented in UniPhi. Data dictionary - fully customizable. Globally, by category or by signal. Easily trace signals & parameters throughout model. Effortless Management of Large, Complex, Multi-Rate Models. Easy Addition/Removal of Features Enables Rapid Virtual Integration and Test. Increases Cohesion and Reduces Coupling. Easy Management of Any Embedded System.